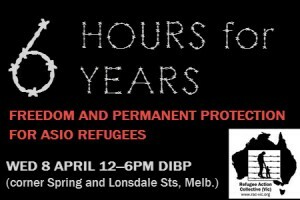 Wed Apr 8 12-6pm I 6 Hours for 6 Years: Free the ASIO Refugees! The Refugee Action Collective (RAC) has called a “6 hours for 6 years” demonstration to demand freedom and permanent protection for indefinitely detained ASIO refugees. Join us for as long as you can between 12pm–6pm on Wednesday 8 April at the Immigration Department (corner of Spring and Lonsdale Streets, Melbourne). Even if you can just drop by for a few minutes, please come by to lend your support and demonstrate your solidarity for refugees. Speeches will start at 12.30pm and the day will end with a candlelit vigil from 5pm. Music: Les Thomas, Little Foot, Shannon McDonough and Jessica Austin. There are refugees who have been held in Australian immigration detention centres for more than six years. After they were found to be genuine refugees at serious risk of persecution in the countries they fled, they were given negative security assessments by ASIO. They were not told the reasons for these assessments, or allowed to challenge them. The Department of Immigration has kept these refugees locked up indefinitely on the basis of ASIO’s secret assessments. In recent months, many have at last received security clearance, but they are now denied permanent protection – and family reunion – due to new migration laws. The 8 April date is significant as it marks two years since the start of a hunger strike conducted by indefinitely detained refugees in the Broadmeadows detention centre (MITA). After ten days, the refugees ended the hunger strike because Immigration officials told them this was the only way their cases could be processed. Two years later, many are still waiting. RAC will be at the DIBP for six hours, one hour for each year they have spent in detention. If you can’t stay the whole time, please join us for as long as you can. City workers might be able to make the 12.30 speak out and/or the 5pm vigil. We would love it if you could join at this important action. If your group or organisation is interested in committing to a block of time during the afternoon and have ideas for activities you can contribute, please get in touch! Activities could be anything from the political to the artistic to the personal. You might like to share a report or story about the plight of indefinitely detained refugees, or perform music or poems, or coordinate a creative way for us to send messages of support to these refugees. We’d love to work with you and hear your ideas.